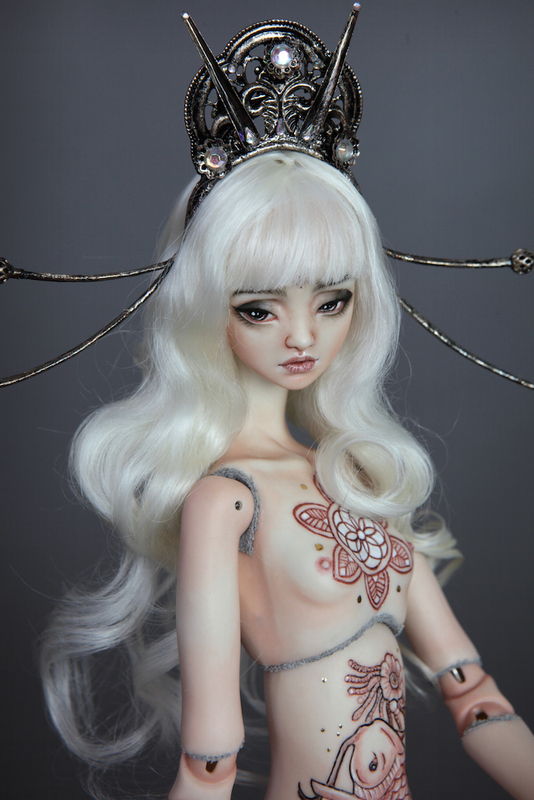 We are no longer accepting special requests of any kind, if you really like this doll don’t hesitate to purchase. As we will NOT reproduce it again. 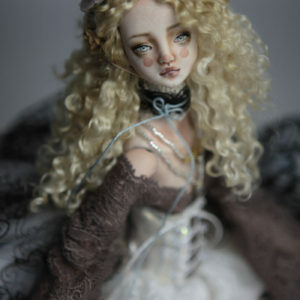 Fine Art One of a Kind BJD Doll is made using the finest and silkiest milky white translucent porcelain. Fully articulated body with 19 articulation points with leather lining on every joint for a smoother rotation, extensive movement and posing. New upgraded delicate and detailed hands. Intricate engraved and painted tattoos all over her delicate body. Real 22K Gold painted accents. One of a kind premium soft removable brushed and styled mohair wig. Hand made crown made of a combination of metal and aurora borealis crystals. Custom made cushioned doll box is made using matching brocade fabrics, raw silk and vintage metal hinges. Box has the appearance of a treasure chest and is ideal for traveling as the doll fits perfectly with the double layered cushion on the lid and inside the box. As all of our dolls will arrive with a hand made wood base with an engraved FHDolls logo. It is made with a strong galvanized rod and flexible top. 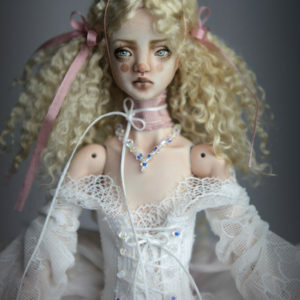 Due the nature of this one of a kind doll, returns are not accepted.